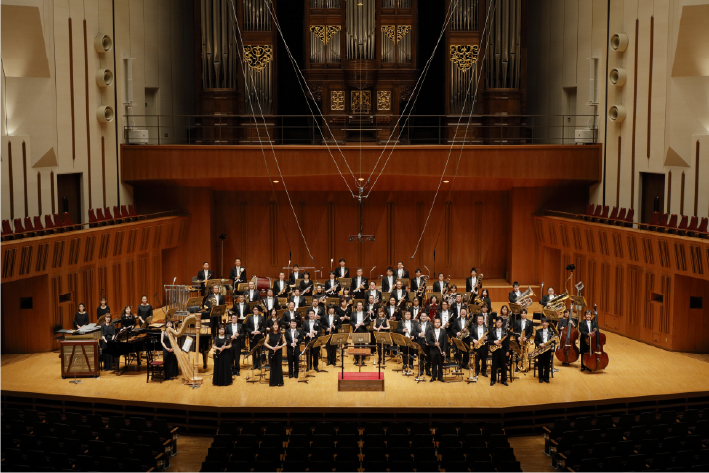 Originally founded in May 1960 as the Tokyo Kosei Symphonic Band affiliated with the lay-Buddhist organization Rissho Kosei-kai, theTokyo Kosei Wind Orchestra (TKWO) has performed under their current name since 1973. Having Frederick Fennell as its Conductor Laureate, the TKWO appointed, in January 2014, Takeshi Ooi to be Conductor, Koichi Fujino to be Music Advisor and Thomas Sanderling to be Principal Guest Conductor. Previous conductors have included Yasuhiko Shiozawa, Masato Usuki, Tetsusaburo Hirai, Douglas Bostock and Paul Meyer. From 1970s, when instrumental wind music tended to be associated with marching bands, to today, the TKWO has actively collaborated with distinguished conductors international as well as national, to enlighten people to the kind of “wind ensemble” that Frederick Fennell, who developed the TKWO, had advocated. For the past subscription concerts, the TKWO performed under the batons of Kazuo Yamada, Hiroyuki Iwaki, Kazuyoshi Akiyama, Michiyoshi Inoue, Ryusuke Numajiri, Kazufumi Yamashita, Ichiro Saito and Tatsuya Shimono, and others. These years, the orchestra has also invited conductors also notable in the classical music world such as Taijiro Iimori, Norichika Iimori, Radomil Eliška, Kazumasa Watanabe, Kentaro Kawase, Shizuo Z. Kuwahara, and more. Each subscription concert, which focuses on building appreciation of the genre, has earned plenty of acclaim. As for activities abroad, from the first tour in Europe in 1989 to the concert held in Taiwan in 2011, the TKWO has toured overseas eight times. In recent years, the TKWO holds, as a new project with its Music Advisor Koichi Fujino, a series of concerts entitled "Entertainment Concerts". Having invited prestigious singers such as Ryoko Moriyama, Hiromi Iwasaki, Junko Yagami, Shigeru Matsuzaki, amongst others, the project has fascinated numerous audiences. The TKWO has often performed on TV and radio shows. Its recent appearances include the Japanese TV programs such as Untitled Concert (TV Asahi Corporation Network), La La La Classic and Classic Club (NHK TV) and the radio show The Sound of the Wind Ensemble (NHK FM radio). Since 2013, the TKWO has been participating in the "Flowers Will Bloom" charity song project, a part of NHK's TOMORROW series to support reconstruction efforts in areas hit by the Great East Japan Earthquake. Also, the very popular annual New Year Hakone Ekiden marathon relay race's theme music, performed by the TKWO, contributes to the lively atmosphere of this television broadcast event. The TKWO actively records and releases CDs. In the last few years, the orchestra has released its recordings on labels such as NIPPON COLUMBIA, UNIVERSAL MUSIC JAPAN, KING RECORDS, Victor Entertainment, avex-CLASSICS, BRAIN MUSIC, and more. The TKWO is the winner of the 51st Record Academy Award 2013.